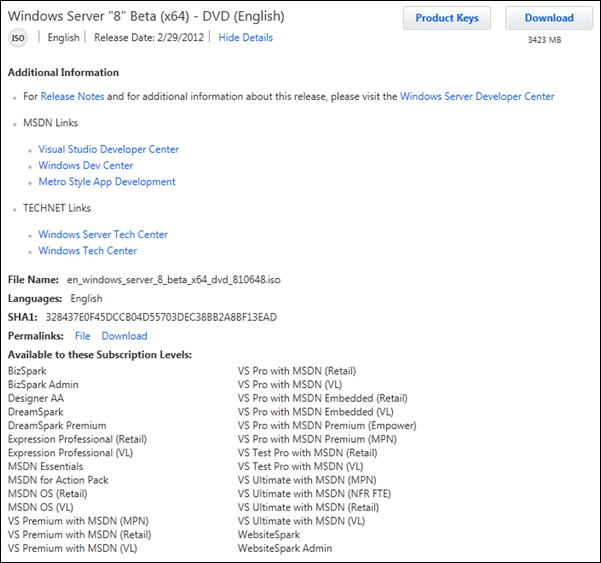 Windows Server 8 Beta Now Available On MSDN And TechNet – Download It Now! Right on the heels of the Windows 8 Consumer Preview launch, Microsoft has also released the bits of Windows Server 8 on MSDN and TechNet. Available in both 64-bit ISO and VHD flavors, it is only available in all languages – Chinese (Simplified), English, French, German, and Japanese – through the former; the VHD is available in English only. With Windows Server 8, Microsoft have made clear in their whitepapers and documentation that they are heavily working on virtualization and cloud-based applications. On the virtualization front, we can expect Hyper-V 3.0, which will bring forth the ability to perform multiple Live Migrations at the same time, increased scalability – you can now run it on a host machine with a maximum of 160 logical processors (compared to Hyper-V’s current support of 2) and 2TB of RAM (compared to Hyper-V’s current support of 1TB). Windows Server 8 also packs a new virtual hard disk format (VHDX) that supports eight times the current 2TB size limitation that applies to ‘old’ VHD files. As for the cloud, Microsoft mentioned various times throughout the whitepaper that Windows Server 8 offers a "private cloud solution". This optimized cloud functionality that Microsoft is touting is made possible through various new features. For example, identity federation with AD FS, which assists with cross-premises connectivity. Improved scalability and management capabilities of multi-server deployments were also touted. The new improvements are far too numerous to list out in this post alone; in fact, on top of releasing the Windows Server 8 bits today, Microsoft also released a 92 page product whitepaper that provides a nice overview of many of the new features and changes in Windows Server 8. There are also other nuggets of information on top of the whitepaper that can be found on the Microsoft Server and Cloud Platform website for all of you Windows Server nuts — I mean, enthusiasts — that which to get familiar with the new server OS. Microsoft’s focus, along with the spotlight of the press, has mainly been on the consumer front of Windows 8. With the need for Microsoft to branch out into the mobile sector and maintain relevance, the large risks that they have taken to do so with their "one Windows" approach has largely been the talk of pundits lately. Nevertheless, we shouldn’t forget that they are cooking up what appears to be a pretty awesome Windows Server release as well. And while Windows 8 client may not fare so well in the enterprise at first, perhaps they may be quicker to jump the gun on its server counterpart. You may grab the bits officially through MSDN or Microsoft TechNet.